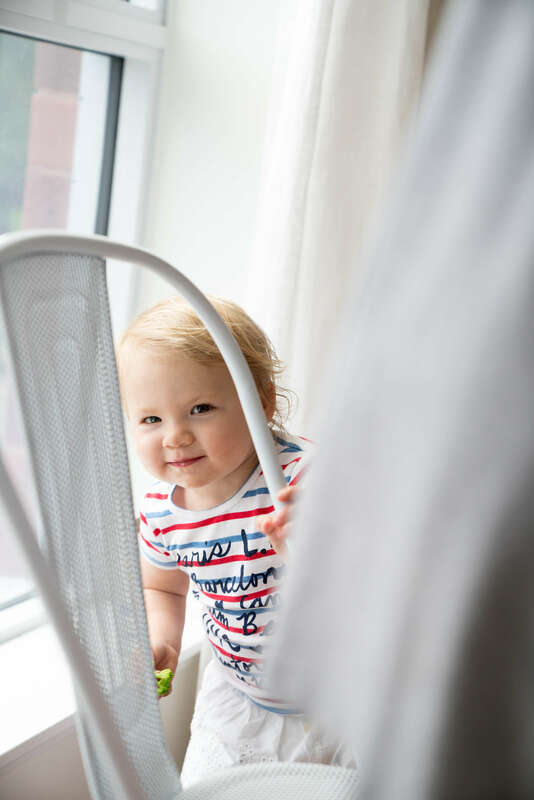 My daughter Vienna LOVES pasta and it seems like all my friends with toddlers are pasta-obsessed too. Not surprising right? Kids love carbs! However, the large majority of people are eating white pasta [sad face], and while you might like the taste, it's not the healthiest choice. 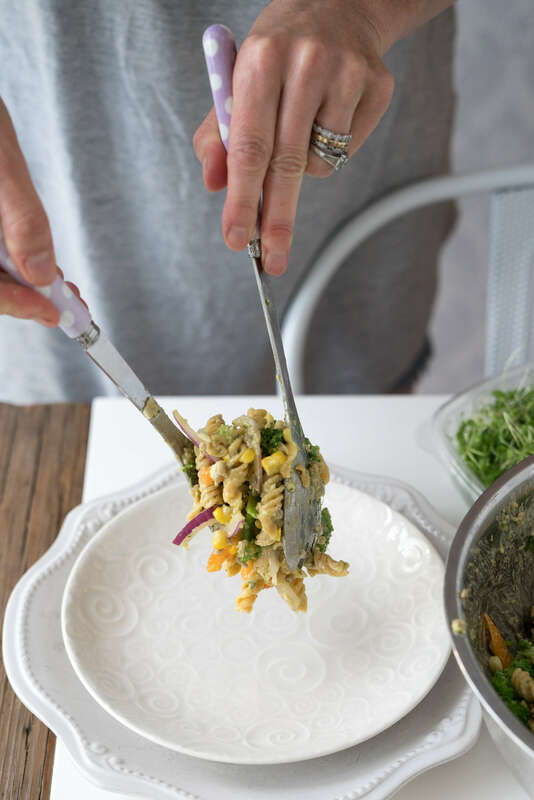 Given Vienna's (and Walker's) love for carbs, I'm always coming up with new recipes where I can pack as many nutrients into a bowl of pasta as possbile - enter my "Kid-Approved" Creamy Avocado Pasta Salad. 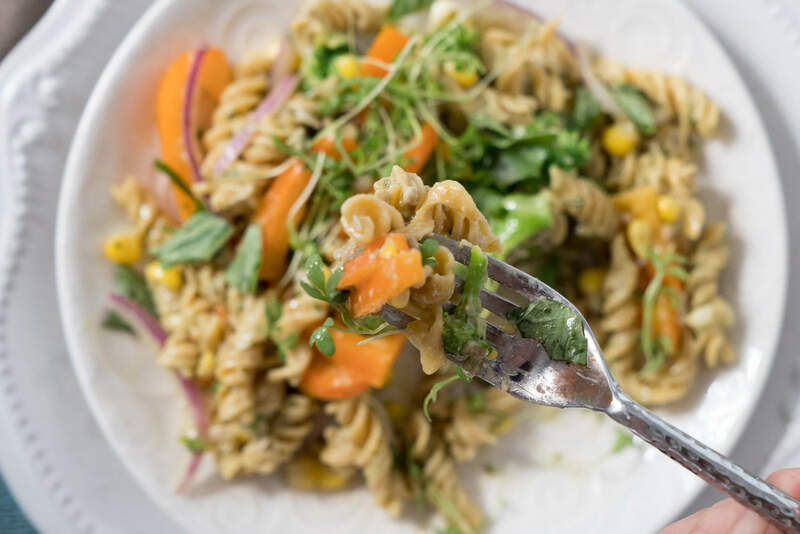 After a quick google search, I discovered that North Americans consume 15.5 pounds of pasta per year so healthier alternatives are definitely in need! 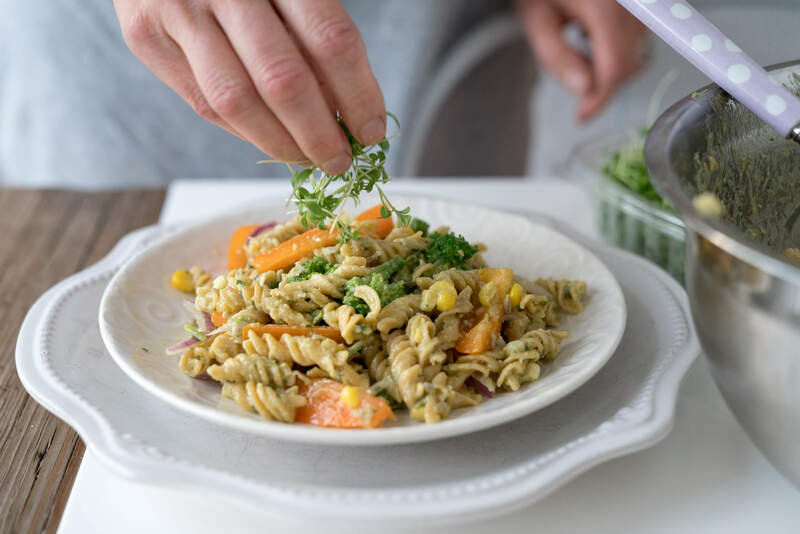 One pasta I recently discovered is a healthier, heartier, fibre-rich and super-tasty option - meet my new favourite pasta: Chickapea pasta! And guess what? It's Joyous Health Approved (aka #joyousapproved). 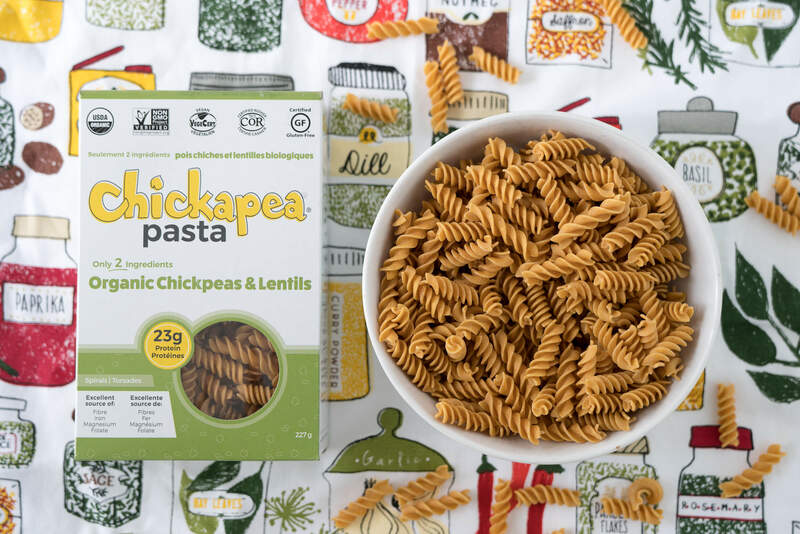 Before I share this recipe with you for my "kid-approved" Creamy Avocado Pasta Salad, I must tell you that this pasta only has two ingredients: organic chickpeas and lentils. Yep, that's it. Most importantly, my daughter who is almost two, loves it - it feels like a #parentingwin / #momwin everytime she eats it! We love it so much, that I often make a double batch so Walker and I have leftovers for lunch the next day. And even though I refered to this recipe earlier as "kid-approved" don't feel you can't get excited about it as an adult. Please! I would be flattered if you got excited about my recipe! Let's get to this awesome recipe shall we? In a large salad bowl, combine all the salad ingredients (excluding the pasta). Save garnish for topping once you've adding the dressing. Using a food processor, add all of the dressing ingredients and blend until creamy. 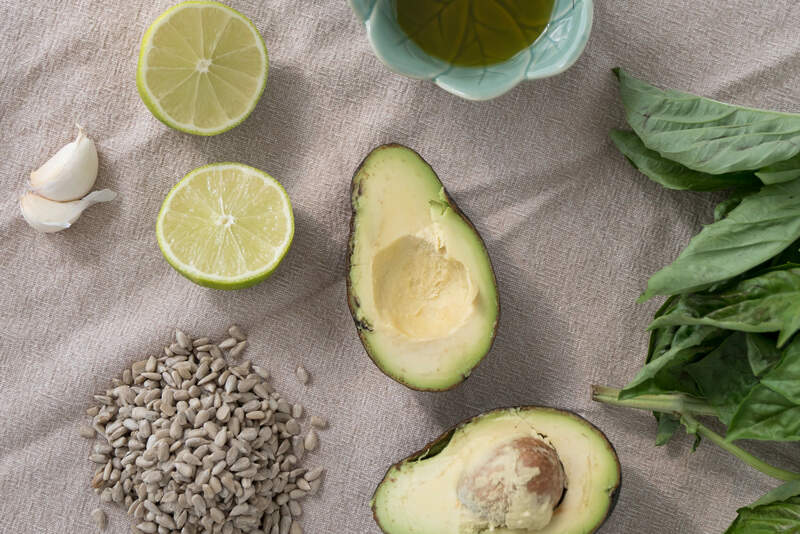 If the avocado you're using isn't soft, you may need to add a touch more liquid to make it creamier. In that case, you can add more olive oil or some water. While you're making the dressing, boil a large pot of water and add the Chickapea pasta. Bowl until al dente. Remove from hot water immediately and either put in a bowl of cold water or run under cold water. *Bring a pot of water to boiling, toss in broccoli and cook for 3 minutes or steam.You still want it to be crunchy. **Fresh corn is best if you can get your hands on some! 2-4 servings depending on how hungry you are. One of the reasons I love this pasta is that it's got "substance" to it. Meaning, it feels like you're actually eating something and you feel satisfied after a bowl of this pasta - that's thanks to the protein and fibre. Unlike white pasta, where you can eat three bowls and still not feel satiated because it's lacking in both. Plus it's gluten free, vegan, organic, kosher and comes packed with 23 grams of protein and 11 grams of fibre per serving. No added sugars, salt, or ingredients you can't pronounce. Aside from the pasta, I packed this recipe with tons of whole food, colourful, flavourful ingredients. 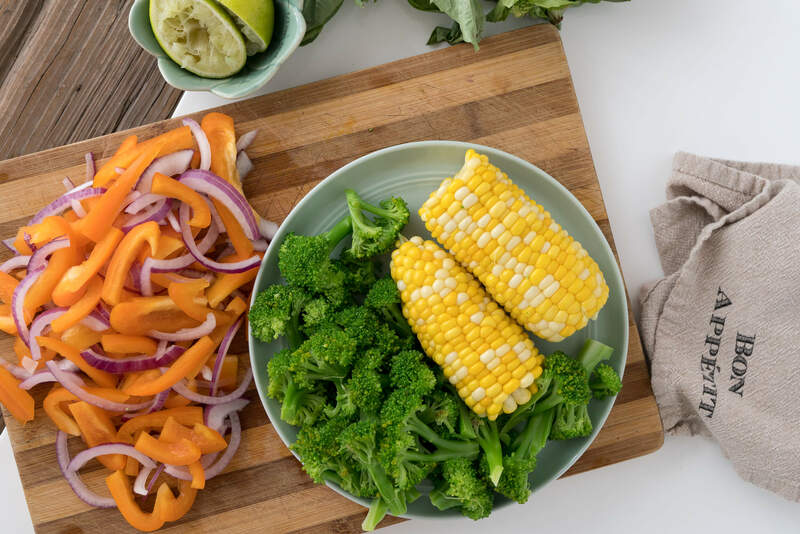 Have you had any local corn yet this summer? Omg, I picked up some the other week at the farmer's market and it was so sweet and full of flavour. If your kids don't like onions, just nix them, no biggie. Vienna is obsessed with onions. It's both hilarious and odd at the same time. If I'm eating a big salad and she's not because she can't eat lettuce yet without choking, she'll say "mama, mama, onion, onion!". Then she has baby-onion-breath which might sound gross, but it's ridiculously cute. If you've tried my creamy dressings from Joyous Health or Joyous Detox then you're gonna love this one! The ingredients are super simple, as pictured below. Feel free to top the pasta with anything you like. Sometimes I use sunflower sprouts or mung bean sprouts and this time, I added some microgreens! Microgreens are just what you might guess they are... they are "baby" greens. I buy them at the farmer's market. There you have it! My latest joyous recipe that's perfect for busy evenings when you want something fast, healthy and yummy or when you're moving slower on the weekend! This recipe is also perfect for a BBQ or picnic. Just keep it chilled because it tastes best cold in my opinion. And I know you're wondering where you can find this pasta. I buy it at my local health food store in the Junction (Toronto), but you can use their store locator here in Canada and the U.S. and you can buy it online too. Have a joyous day and a happy summer! Ps. By the way, I created this recipe just before I left for Austria and as I put in these photos I'm getting sooooo hungry! You can check out my Austrian adventures on Instagram! I love everything about this recipe. Such a beautiful, healthy, clean creation. Perfect for dinner day of the week. 2-4 servings depending on how hungry you are. If you're serving 4 adults, to be safe, I would double the recipe. You've got yummy leftovers if you don't eat it all! Yes super easy! I buy it at my local health food store. I've linked the "Store locator" in the post so you can just search your area. Or you can just buy it online. Looking forward to making this! I was just wondering if the salad would turn brown in the fridge overnight, given that an avacado is used? My grandchildren ages 1 1/2 and almost 2 are coming for the holidays and I'm looking for nutritious, easy meals. I'm looking forward to making the chickapea pasta recipe. And I love pasta so I'm looking forward to this recipe for myself as well. Will have to find out where I can find the pasta as I live in a rural area. I made this last night. It was very yummy! The dressing was scrumptious! Thank you for your fabulous blog and all of the great recipes. I’m so glad I found you! Can I make the dressing in advance (the night before)? i have all ingredients except sunflower seeds. i do have pumpkin seeds. do you think they'll work?